Student Care is at the heart of everything we do at the College. We understand that the emotional wellbeing of students is fundamental to their academic success, and so we offer a holistic approach that develops students’ understanding of wellbeing through explicit teaching of strategies to develop growth mindsets, grit and wellbeing. These programs are supported by various external providers who visit the College to share their expertise in these areas. We pride ourselves on having a safe and welcoming community, where all people are valued for the person they are and the contribution they make. With our Anglican ethos underpinning all ofo ur behavious, we aim to educate our students to be compassionate, caring and positive contributors to our community and society beyond school. As our students develop into young adults, the decisions they are required to make take on more significance and the factors that impact on their thinking become more powerful. We want our students to understand the way that their brains work, and be aware of their strengths so that they can make good decisions and choices. To assist them in achieving this, we provide a series of programs and support mechanisms such as the continuation of the College’s program Flourishing, which is designed to raise awareness of key issues that Senior students may encounter such as social media reputation, sexting and managing stress, dedicated programs in generating good study habits through our Elevate Education course, and a series of sensitively delivered sessions in mental health through a program called batyr, where expert speakers raise awareness about peer support and how external agencies of support can be accessed. In addition, our staff members take a real interest in their students, so that each of them is well known and cared for. We pride ourselves on the strength of our community, and the strength of the relationship between the College and home. Our belief is that the strengths of these relationships mean that our senior students, in adolescent years which can sometimes present academic, social and health challenges, are supported every step of the way. Central to our ability to do this is a Clan structure, with each student at TSAC belonging to on of our four Clans: Keith, McDuff, Robertson and Sinclair. Each Clan fosters an inclusive family mentality where each person is valued and cared for. Each Clan is overseen by a Head of Clan, who comes to know and understand each student in their care as they progress through the College. In addition, from Year 8 until Year 12, students are placed in vertical form groups and spend 5 years with the same form tutor who becomes the first port of call for parents. The combination of form teacher, and Head of Clan allows for strong links between home and school, and ensures that each child is well known, and is exceptionally well cared and catered for. As a further support mechanism, our Year 12 Coordinator takes an active role with our most senior students – supporting them and organising events for them, to ensure that every step of the journey in their most important school year is well planned, productive and memorable. 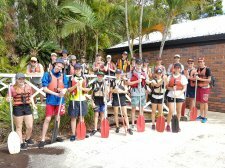 We believe that the important learning experiences that a school provides happen in and out of the classroom, and our vibrant and varied student activities and co-curricular programs are vital in allowing us to achieve our goals of educating the mind, body and spirit of our students.